I’m sure I’m like most of you, with a handful of recipes in “regular rotation”. This is one that comes around often and it’s always satisfying. With both Dijon and grainy mustard, this is a one-skillet dish that’s a perfect, easy weeknight meal or special enough for entertaining. While I think everything is better with bacon, if you don’t have or want to use it, simply skip it and replace the bacon fat with a bit of olive oil to start instead. This dish is lovely with mashed potatoes, or try it with pasta, for a nice change. 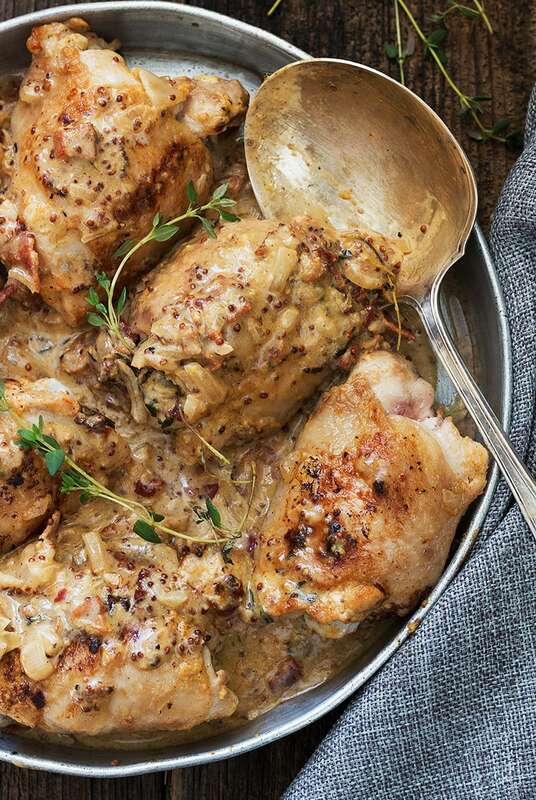 If you don’t have or want to use wine in this dish, simply replace with chicken broth. 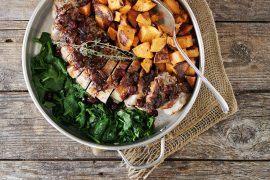 You could also make this dish with boneless chicken thighs or breasts or skin-on/bone-in chicken breasts. For boneless cuts, I would skip the trip to the oven and cook to done right in the skillet. For boneless chicken breasts, I would butterfly them to make thinner cutlets that will cook more quickly on the stove-top. Skin-on/bone-in chicken breasts should go in the oven and would take longer to cook, probably another 10 minutes or so. Recipes like this often call for heavy cream because it’s high fat content doesn’t break or curdle when cooked at high temperatures or when cooked with acidic foods like mustard. So while it’s often tempting to reach for a lower fat cream (or yogurt, sour cream etc. ), keep in mind that it may affect the quality of your finished sauce. 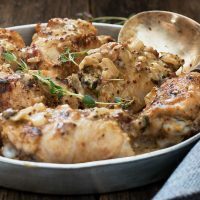 A quick and easy, one-pan chicken dish, that's perfect for weeknights of special enough for company! In a large bowl, stir together the Dijon mustard, paprika, salt and pepper. Add chicken thighs to bowl and toss to coat. Let stand in the bowl while you heat your skillet. Heat a large ovenproof skillet over medium-high heat. Add bacon and cook, stirring until bacon starts to brown. Remove bacon to a small bowl. If you have more than about 1 Tbsp of bacon fat in the skillet, remove the excess. Add the onion to the skillet and cook, stirring, until soft, about 3 minutes. Add the thyme leaves and cook, stirring, about 1 minute more. Remove the onion to the bowl with the bacon. Add the olive oil to the pan and heat. Add the chicken thighs to the pan, skin side down. Cook over medium-high heat until golden brown, then flip over and brown the other side. Pop skillet with chicken into preheated oven and cook for about 10-15 minutes, or until chicken is cooked through. 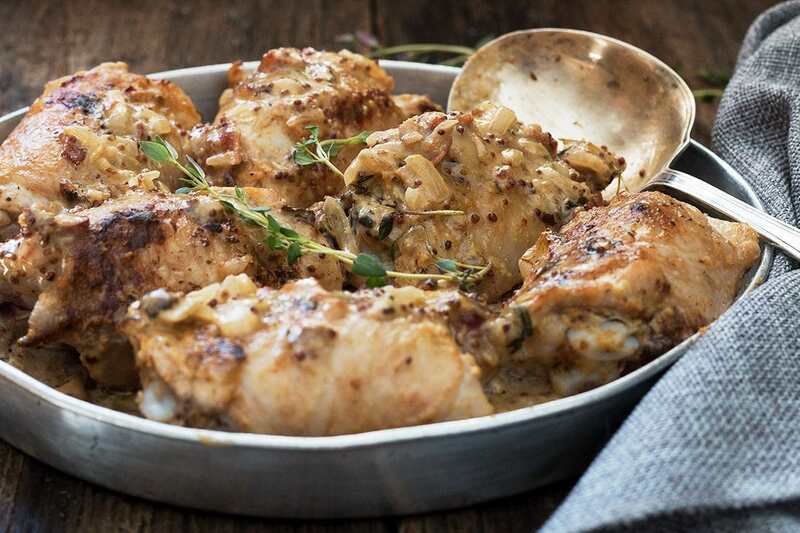 When chicken is cooked through, remove skillet from oven and transfer chicken to a plate. Place skillet back on the stove-top over medium heat until hot. Add wine to pan and cook, stirring to scrape up any browned bits, for about 1 minute. Add the grainy mustard and cream to the pan and stir to combine. Return the chicken, bacon and onion to the pan and allow to cook with the sauce until chicken is re-warmed. Season with salt and freshly ground pepper. Serve garnished with additional fresh thyme leaves. Do I discard the marinade when I cook the chicken? Hi KD, it’s not really a marinade exactly. More of a rub. Just remove the chicken from the bag and add to pan with any of the stuff that is sticking to it. Discard any left in the bag. So glad you enjoyed it, Alex :) Thanks! What a wonderful dinner, served with pasta with oil and garlic. Reminded us of a Guy Fieri meal we made OakTown Chicken. It definitely is a meal that you can serve to company. Jennifer, I have never made a recipe that disappointed. Thanks so much and so glad you enjoyed this one :) Enjoy the farro and the chocolate squares. My husband is always happy when I make them, for sure! Oh my! This looks satisfying and filling. 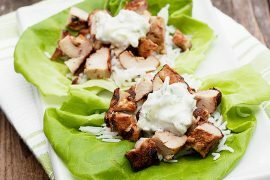 Sounds delicious with all the flavors and I liked that you’ve made this with chicken thigh part. 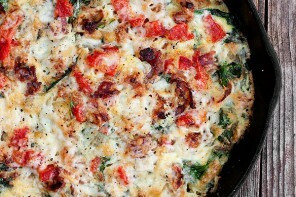 Would love this with bacon and mashed potato. Quick and easy perfect meal! 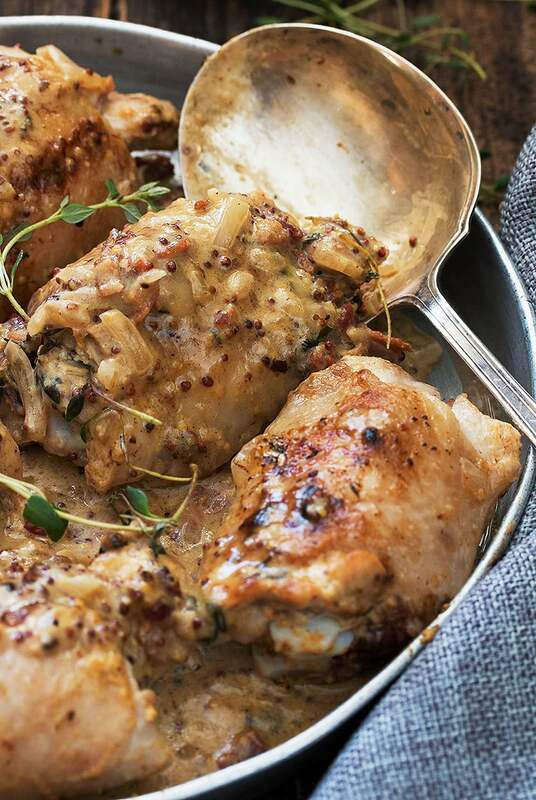 You had me at dijon mustard sauce – sounds incredible! Nobody does chicken like you do Jennifer ~ sharing…and drooling. We’d love this with mashed potatoes smothered in some of the extra sauce!! What a mouthwatering meal Jennifer! My kinda dinner right there, Jennifer. I bet that sauce would be delicious over some mash too :) Love it!